The title of this post, is the same as that of this article on CityMetrics. I tend to agree, as the name doesn’t give too much information about the location, unless you’re a Londoner or someone, who knows about Thameslink. Look at the passenger statistics for 2013-14 for the station and its neighbours. They are in line with their neighbours, but nothing special. So would a renaming help. Of the thirty-one names proposed by CityMetric, one name stands out to me. This is St. Paul’s West. These pictures show City Thameslink station. It is a double-ended station. The Northern entrance is on Holborn Viaduct. The Southern entrance is on Ludgate Hill. There are escalators and lifts at both ends. The station name is given on the platform as City Thameslink for St. Paul’s Cathedral. This is a Google Map of the area. Note St. Paul’s cathedral and Southern entrance to City Thameslink station are connected by Ludgate Hill. As Ludgate Hill suggests, it is uphill to the cathedral. So perhaps a name like Ludgate and St. Paul’s West, might be better. There could always be a referendum or an on-line vote. But some wag would come up with an unsuitable name that would win. City Thameslink station is a modern high-capacity station. The station is fully accessible. The platforms accept twelve-car Class 700 trains. Thameslink will soon be running twenty-four trains per hour (tph) in both directions. Northern destinations include Bedford, Cambridge, Luton Airport, Peterborough, Saint Pancras International and Stevenage. Southern destinations include Brighton, Gatwick Airport, Littlehampton, London Bridge, Maidstone, Rainham and Sevenoaks. There is commercial development over much of the station, some of which is better than others. I have also read that the signalling of Thasmeslink could accept thirty tph through the Snow Hill Tunnel. So the station could see a twenty-five percent increase in train capacity. What the station needs is better East-West connections to make better use of the station. Crossrail connects to Thameslink, one station to the North at Farringdon station, which is not a long walk. I believe this is possible and I wrote about it in A Pedestrian Connection Between City Thameslink Station And St. Paul’s Tube Station. I wrote about this extension in detail in A Connection Between City Thameslink Station And The Docklands Light Railway. City Thameslink station could grow significantly in importance. As to the name, if it grows in importance, perhaps it deserves a more important name? The French would name it after an important politician, artist, philosopher or soldier! If City Thameslink station ends up with a good pedestrian connection to St. Paul’s station and the cathedral, perhaps the whole station complex should just be called St. Paul’s. It would be great to have a direct connection from Victoria, Euston and King’s Cross to City Airport too. City is great for short hops to Continental Europe. 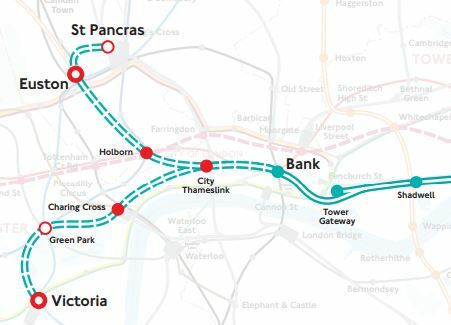 The only line the proposed extension doesn’t connect to is Crossrail. Although therre will be connections at Canary Whaf, Poplar and Stratford. City Thameslink Station was originally called St Paul’s Thameslink but the name was changed on the insistence of the fire authorities who worried that in the event of an emergency it would be confused with St Paul’s underground station. Ludgate was, I believe, the name of a station on an adjacent site prior to the Snow Hill tunnel closing in the early 20C. It is possible that the name City Thameslink was chosen to make the point that Thameslink served the City of London. The City was concerned that the diversion of services away from Moorgate under the Thameslink 2000 project would be detrimental. Thameslink is a cheesy name, suitable for an engineering project but unsuitable for a railway line. (Compare “Crossrail” and “Elizabeth Line”) St Paul’s is a fine name for a station; maybe all of Thameslink should be renamed St Paul’s!